1. Cook sherry and butter on medium heat until simmering. 2. While sherry and butter are coking, rinse button mushrooms and drain in colander. 3. When mushrooms are clean, place in pan with sherry and butter. 4. Add vegetable rub seasoning. 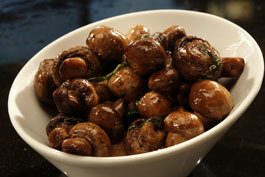 Cook mushrooms until tender, about eight to nine minutes. 5. Just before mushrooms are finished, add parsley and cook until wilted. Recipe by Oklahoma State University, Stillwater, Okla.